Live SunSmart presents “SUNS” of Legends! 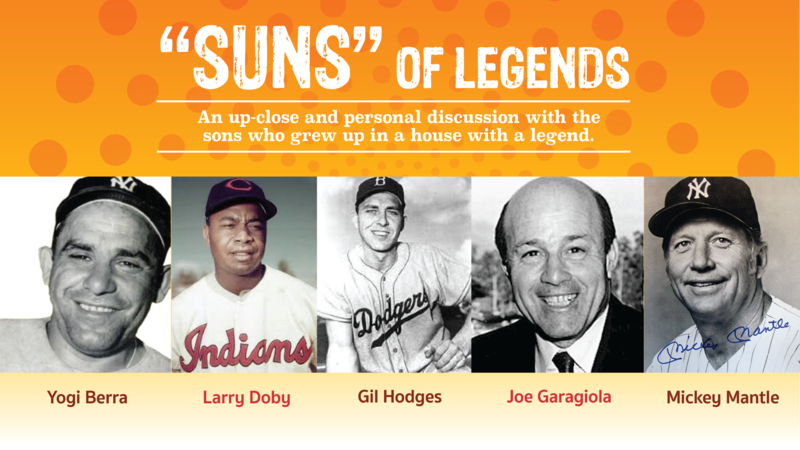 The Live SunSmart Foundation (LSSF) is pleased to announce the “Suns” of Legends event scheduled for Thursday, October 20, 2016 at Forest Hill Field Club, Bloomfield, NJ. This up-close and personal discussion with the kids who grew up in a household with a legend offers a unique perspective and rare opportunity to meet and greet the sons of baseball icons, Yogi Berra, Mickey Mantle, Larry Doby, Gil Hodges and Joe Garagiola and hear all about life with a famous dad. You will find out what it was like for them when their father was on the road, how they dealt with their father as a celebrity, what affect it had on their mother, etc. Coincidently, October 20, 2016 commemorates the 85th birthday of Mickey Mantle! Jim Axelrod, CBS News Senior Correspondent, will moderate the panel discussion and lead an audience-interactive question and answer session. “I’m thrilled to join the guys to talk about the fun times as well as the challenges of being in the Yogi Berra household. It was amazing how Mom kept the household together and us kids in line when Dad was on the road.” said Larry Berra. The evening will include an Open Bar cocktail reception with hors doeuvres; a Meet & Greet Prime Rib Dinner with the sons (limited seating) and an in-depth panel discussion including audience Q&A. “Live SunSmart is honored and privileged that these men have given generously of their time to provide insight on their family dynamics as sons of these MLB greats. This is going to be a special evening and surely a ‘hot ticket’, said Teri Festa, Executive Director of the LSSF. UNFORTUNATELY, DUE TO UNFORSEEN CIRCUMSTANCES THIS EVENT IS BEING POSTPONED. TO STAY INFORMED, PLEASE SEND AN EMAIL TO INFO@LIVESUNSMART.ORG. Your name will be placed on a list and you will receive a special price for your patience. Thanks!